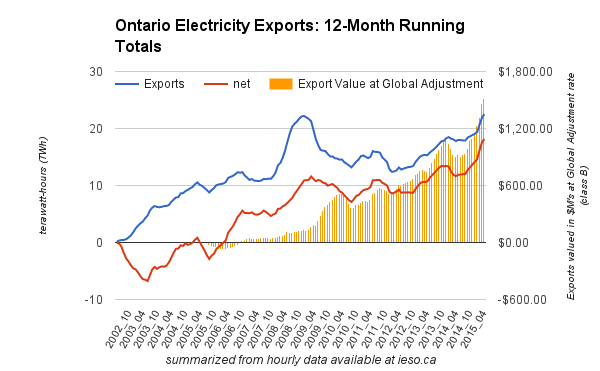 The first quarter of the current year indicates Ontario is exporting record quantities of surplus electricity. It would be better if our surplus electricity was exported profitably, instead of a cost to ratepayers, but alas, that is not the way the Liberal Energy Ministers past and present have structured the portfolio. The first quarter of the current year saw Ontario export a record 6.65 TWh (terawatts) — that’s enough to power 690,000 average households for a full year. The 6.65 TWh sold to our neighbours was up 75% from 3.81 TWh in 2014’s first quarter. We sold that surplus at prices well below what we received. Exports represented 17.5 % of Ontario’s demand in 2015 versus 10% in the same period in 2014. Wind (generated and curtailed) in 2014 was 2.05 TWh and 53.7% of Ontario’s exports; in 2015, wind grew to 2.61 TWh and was 39.2 % of our exports. The concept of exporting is one that economists encourage; however, they expect it will be profitable, create jobs, and not burden the rest of the economy though subsidization. Subsidizing exports is often referred to as “dumping” and frequently challenged under the WTO (World Trade Organization) rules. Examining the cost to Ontario ratepayers for the 3.81 TWh exported in 2014 and the 6.65 TWh exported in 2015 using data from the Independent Electricity System Operator’s (IESO) “Market Summaries” is shocking. The 2014 first Quarter exports cost (average of $102.6 million/TWh) ratepayers $391 million to produce and was sold via the HOEP (hourly Ontario electricity price) market at an average of $75.54 million/TWh. That cost Ontario’s ratepayers $103 million. In 2015, the 6.65 TWh exported cost Ontario’s ratepayers $672 million (average cost of $101 million/TWh), and sold at an average of $35.4 million/TWh, costing Ontario ratepayers $437 million. To put some context to the latter, the money lost exporting the 6.65 TWh was equal to 6.6 cents per kilowatt hour. The foregoing subsidy does not include other costs Ontario’s ratepayers pick up including: spilled hydro, steamed-off nuclear or payments to idling gas plants. The subsidies supporting exports is double what Energy Minister Bob Chiarelli suggests is needed to assist almost 600,000 “low-income” households to pay their hydro bills. Ontario’s ratepayers will start paying the latter January 1, 2015. This analysis would not be complete without noting the cost of wind generation (two quarters) in 2014 was $252.7 million (average cost of $123.5 million per/TWh) and $322.5 million for 2015! Perhaps our Finance Minister should “focus” on the harm to Ontario’s ratepayers instead of dumping our surplus electricity on our neighbours who are happy to take it and not raise the issue with the WTO. If the first quarter of 2015 is indicative of the full year, ratepayers will pick up $1.8 billion in subsidies to supply our neighbours with cheap electricity, while Ontario’s citizens struggle. The views expressed here are those of the author and do not necessarily represent Wind Concerns Ontario policy. What I’d like to see tabulated is a bono fide list of industries who have packed up and moved south due to electrical rates. For example, the other day Toyota announced that they are moving the Corolla production out of Cambridge…. how big a role did electrical rates play into that decision? Unfortunately, companies often have some other reason that they state as to why they have moved but it stands to reason that electrical rates have to be a major reason. If the electorate understood that, it would make a big difference in their response to what the GEA has done to the province.